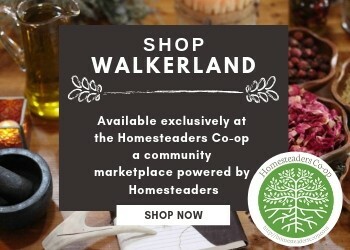 I thought it was about time I showed you what’s inside the Walkerland greenhouse this year! It looks very tidy and tame right now but it wont be long before it becomes an aromatic jungle of green with splashes of orange, yellow and red. The tomatoes and nasturtiums will climb tall (with a little coaxing from me) and beneath that all of the peppers and herbs will flourish with thanks to the bees and other pollinators that buzz around this space happily. 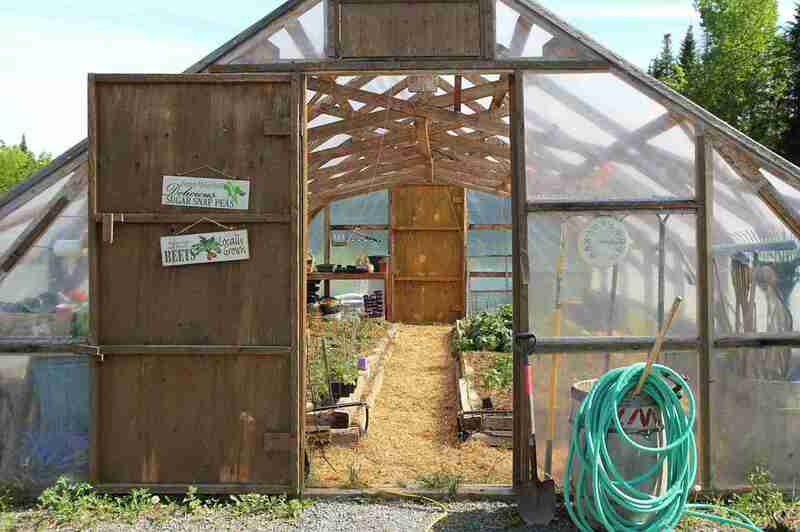 The greenhouse is a basic wood frame covered with plastic. It’s got two massive doors on both ends, and a little pop up vent above each door. Both sides have drop down flaps that open up for good air flow on those super hot days. It has two long raised beds inside. There is also a simple drip irrigation system that we need to repair. We are currently repairing the sides of the greenhouse, they have rotted away and it’s been quite tricky because nothing is level or straight. It was in rough shape when we moved here and there have been a lot of tricky repairs that have required some creativity and a willingness to forego perfection. It’s been worth it though, I really do love this greenhouse. 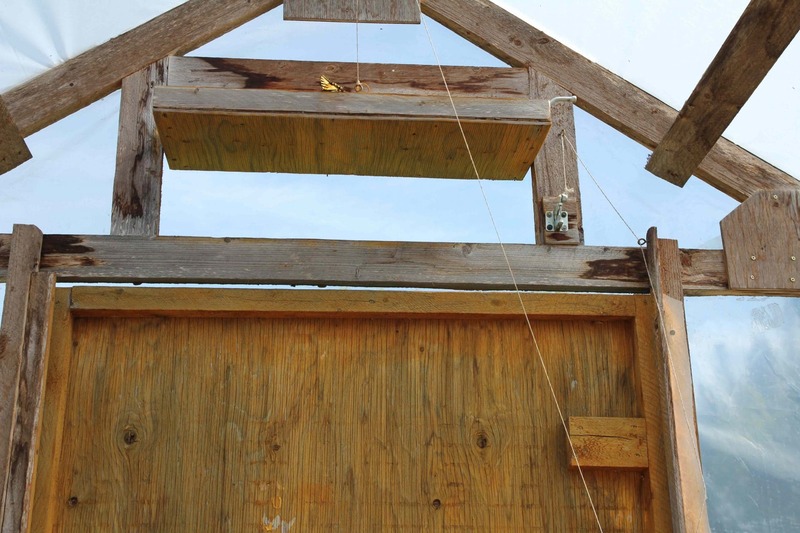 This is the nifty flap above each door, powered by twine and gravity. I’ve really simplified what we are growing in here this year: herbs (both annual and perennial) peppers, tomatoes nasturtium and very possibly peas too. I also have a small patch of ginger planted in here. I’m not sure how that will go but it’s a fun little experiment. 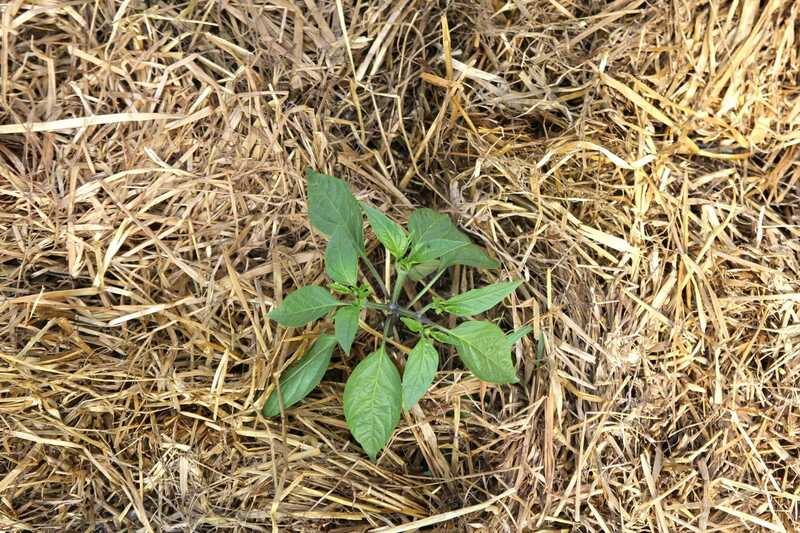 Everything is heavily mulched with straw to regulate the soil temperature and help retain moisture in the soil. This means the plants require less watering which is always a good thing! 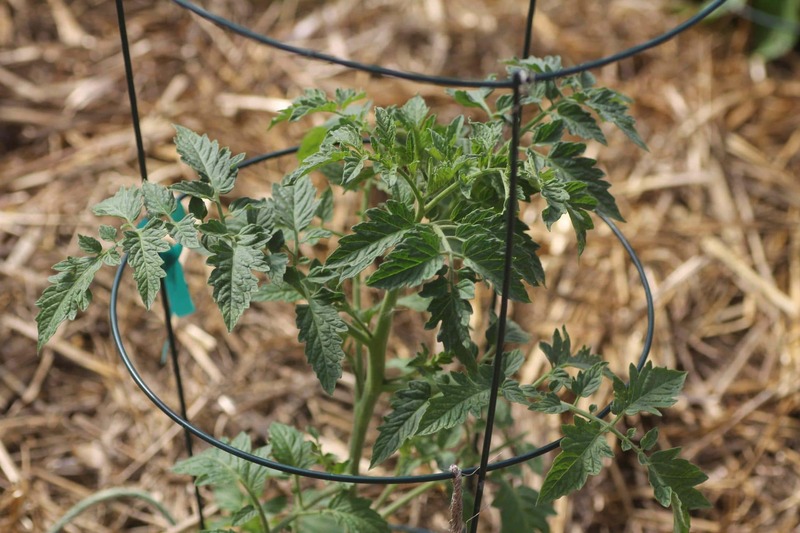 We strongly dislike tomato cages BTW – such horrid, flimsy contraptions! We inherited these with the greenhouse so I use them but I also hang twine from the rafters and use that to support the tomatoes when they get really big. I almost forgot about the kale! It’s such a wonderful plant to grow. I planted the kale in this photo when it was still winter outside. We’ve been eating heartily from these plants since early spring. The plants are very healthy and seems to be doing just fine in the heat of the greenhouse. The kale tastes lovely and sweet and not at all bitter which I know can happen when it is too hot. 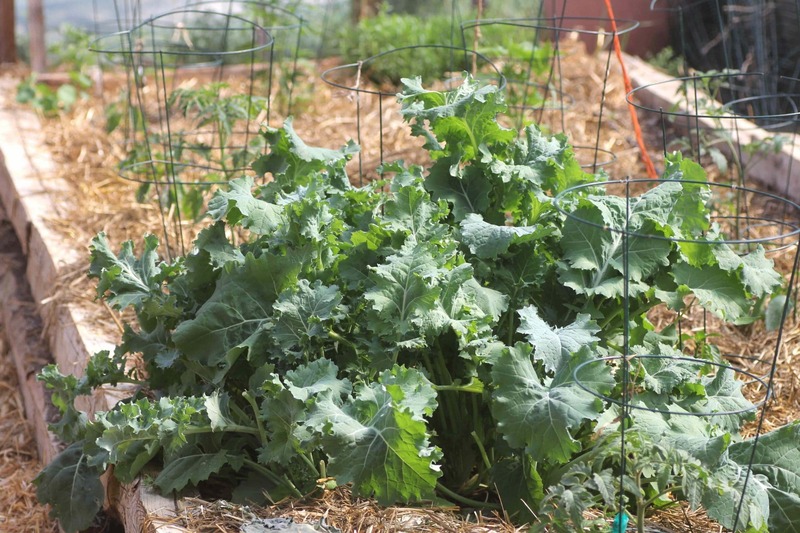 Fingers crossed that we’ll be enjoying this kale all summer. Most of the peppers were started from our own saved seeds. They are doing great. One of them is called ‘Fish Hot Pepper’ and it dates back to pre-1870. Other varieties we are growing are: sweet banana, marconi yellow and king of the north. A wide range of heirloom tomatoes are planted in the greenhouse: cherry, paste and nice slicers with names like: mortgage lifter, black cherry, sweetheart, green zebra, red zebra, amish paste and more! We also plant some tomatoes outdoors to keep things nice and diverse in the garden but they always do best in the greenhouse. 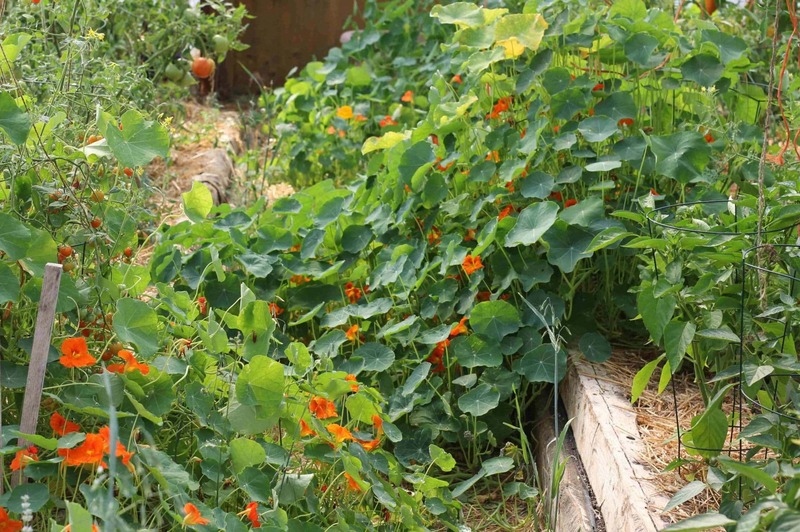 I am a big fan of nasturtium and grow them just about everywhere I can. They are great at self seeding so I always have little volunteers popping up here and there around the garden. We also save the seeds in the fall and I end up with jars filled with seed. The leaves and flowers are edible and very tasty (if you like water cress you will love nasturtium)The flowers add such a beautiful burst of colour to salads, beverages and cakes. It’s hard to imagine right now but each nastirtium plant will become quite big and will be beautifully adorned with red, yellow and orange flowers. 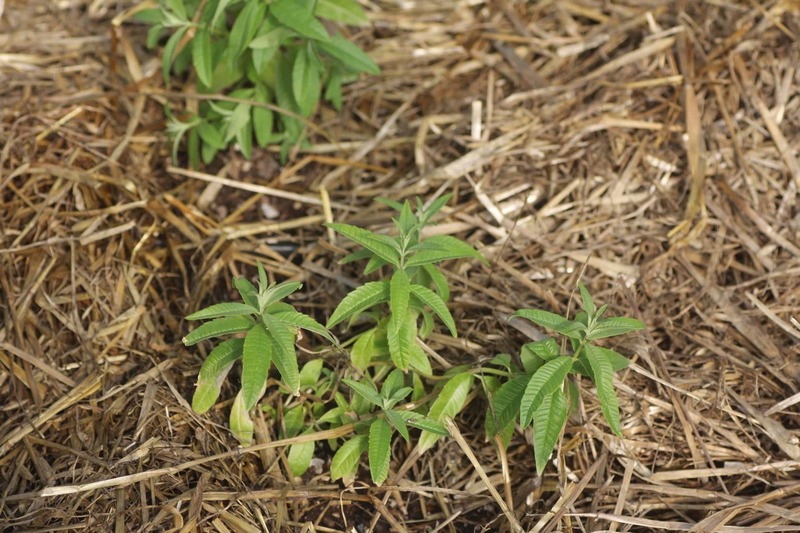 You can let it grow along the ground where it will suppress weeds or you can help it grow upwards on trellises. I tend to do both. Here is a wild example of what it can grow into. most of the herbs are started from seed in the house. This year I treated myself to a few extras from the nursery including stevia and lemon verbena. Neither are perennial or hardy here but It would be nice to have some in the herb cabinet. 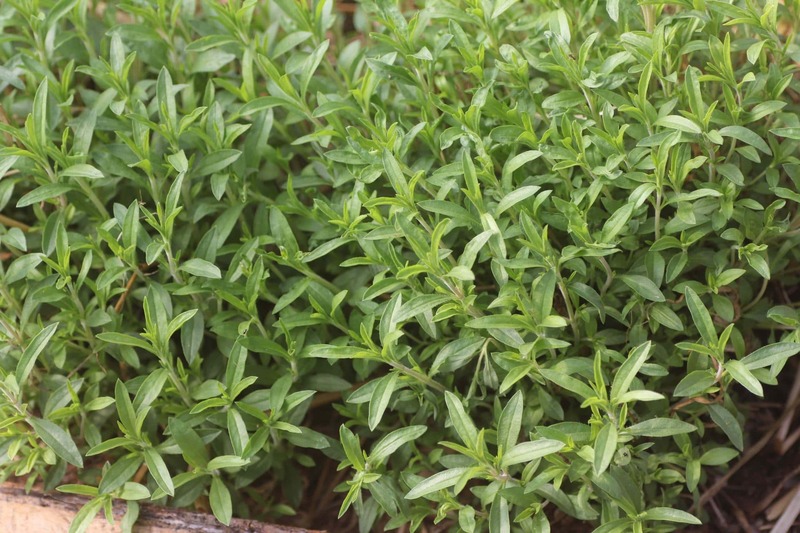 Over the summer I will trim all of the herb plants regularly for a nice steady harvest over the summer. We will dry the herbs on racks so that we have a nice range of herbs to choose from over the winter for cooking, teas, remedies and more. We are growing Italian large leaf basil and another called Genenovese Basil. Neither are hardy here so they are planted as annuals. 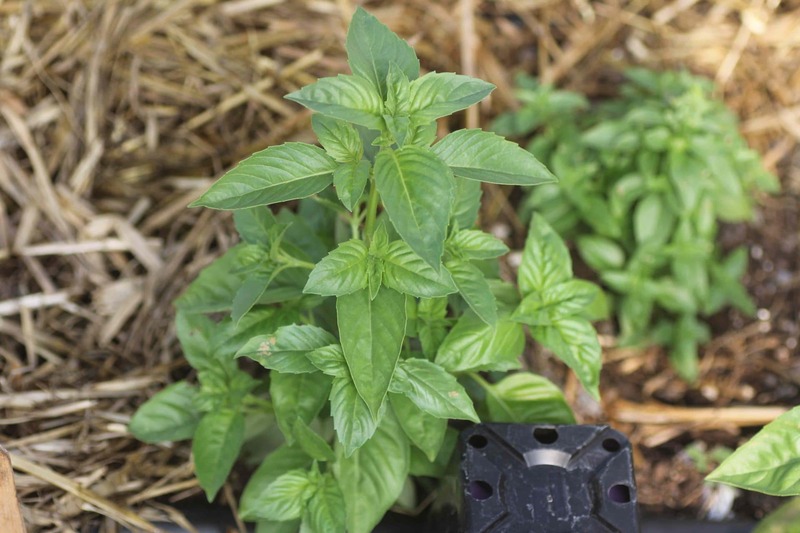 I find basil really easy to start from seed and tend to grow quite a few plants. This is a perennial herb in our zone 4 climate. This is it’s third year in the greenhouse and it has flourished. The bees really enjoy it in the autumn when it flowers which is a nice added benefit to growing it in here. Rosemary is an annual for us. I only planted three plants this year – most of my seeds didn’t germinate. It should be plenty for our needs but I do find it finicky to start from seed. I’ve never grown it in the greenhouse so I am curious to see how it performs. This is a new one for me, I’ve never grown stevia before. 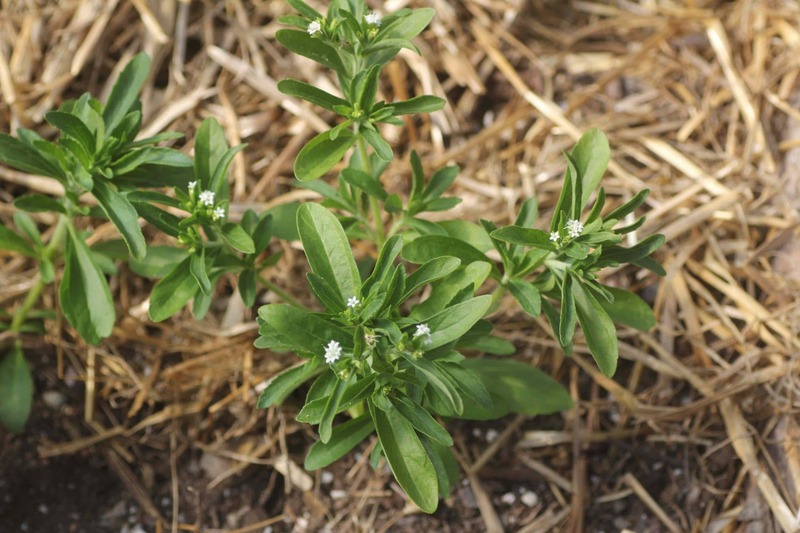 After doing a little reading I discovered that stevia is a member of the Asteraceae family, which includes sunflowers and chrysanthemums. I am excited to be growing lemon verbena for the first time this year. It is not hardy here and has to be started from seed each spring but we will harvest all we can for making teas and tinctures. I can’t wait to see how this one grows. I have some planted in the garden and some in the greenhouse to compare. I also wanted to mention that I always plant things in multiple areas of the garden. A lot of the plants growing in the greenhouse are also in other areas of the outdoor garden. It’s interesting to observe the difference in health, pests, and production depending on where you plant things. I learn a lot from this and can adapt our growing methods accordingly. It also means that if something goes wrong (a dog decides to dig for treasure for example – Molly!) there are still other plants to fall back on. 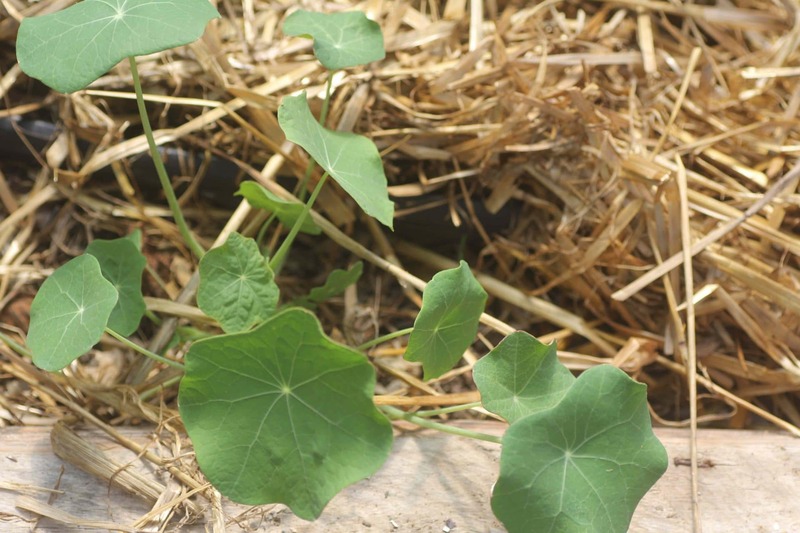 Using Buckwheat & Green Manure&#8221; for Home Gardens! My greenhouse is too small to grow things all summer and it has benches. I (well, my husband actually) plan to build a rocket mass heater in it at the end of this summer so that I can grow some plants all winter. We will also put some water barrels against the insulated north wall to absorb the heat and release it during the night. It won’t allow us to grow tomatoes or cucumbers but I should be able to grow greens and maybe some brassicas. The frost in early June killed the tomato, pepper and eggplant seedlings that I started so I had to buy more. 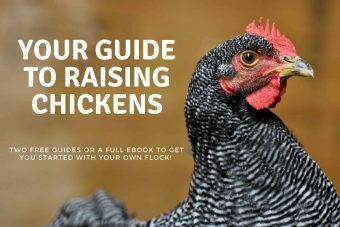 We have only lived in Queens County, NB for 3 years so I am still learning. Next year I will make sure to keep my plants protected for much longer. I keep my rosemary in a pot and bring it inside in the fall. This has worked well for me for quite a few years.